HTC (for now) is the company with the largest selection of Android devices. 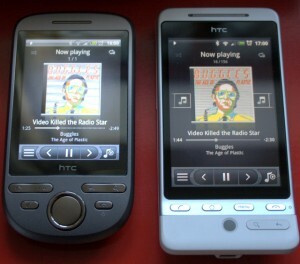 They were the first one on the scene with the G1 and they have one of the best all-around devices available, the HTC Hero. They’ve recently released an affordable device, the HTC Tattoo and I’d like to compare the two for you. There are some differences when stacked up to the Hero that might turn some away, but the Tattoo is still a device worth considering. This first list could be all considered as Tattoo PROs. It is cheaper than a Hero. You can get it for free with some contracts and generally would be between 100 to 150 euro less than the Hero. For lots of people that is very important. It comes with Android 1.6 (Donut) while the Hero is stuck with 1.5 until HTC releases the 2.0 update.Â However, it might be available for the Tattoo as well.Â The device comes with the HTC Sense UI, giving you 7 pages of home screen and the possibility to save your Scenes amongst other things. It has a FM radio and the Hero doesn’t. It has a cover that can beÂ customized like the MyTouch. 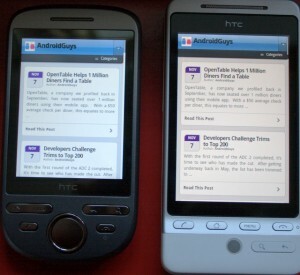 It is smaller than the Hero and would be one of the smallest Android devices available. For some, size does matter. Same as the Hero, it has GPS, G-sensor and digital compass. The battery life is roughly the same as the Hero and all other Android devices, you can get one day on one charge. It has a resistive touchscreen smaller than the Hero.Â More on this in a bit! It doesn’t have the trackball but a 4-way navigation control which is not great to use and takes a huge space up on the device. The 240×320 QVGA resolution means that lots of applications are not available on this device. Developers have to adapt their interface, or at least make sure it looks ok on the smaller screen. It has a 3.2 megapixel camera with no flash, though the quality is as good as with the Hero. As you can see, screen size excluded, there are not that many differences between the Tattoo and Hero. The Tattoo should definitively be in the list if you are in the market for a good, small and affordable Android device. Now, as promised, lets get back to the screen. 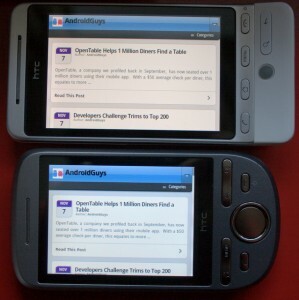 There are 2 main types of touchscreen available on Android devices. The Tattoo has a resistive touchscreen while most other Android devices have capacitive touchscreens. You can read the Wikipedia articles linked to know more about them, but to keep it simple: what it means is that with capacitive touchscreen you need to use your fingers with no pressure and can have multi-touch; with resistive touchscreen you have to use pressure with your finger or a stylus and you can’t have multitouch.Â The lack of multitouch is not really an issue because so far it is not used much on Android. Using only your finger on the Tattoo screen does not work well if there is not enough pressure. You need to use your nail to be accurate, or even a stylus would be better which is not included with the device. HTC should really have done something to help–they could have included a stylus with a holder in the device or a guitar pick (like Nokia’s 5800). Some would argue that HTC should not have used a resistive screen in the first place, but keep in mind that first it is cheaperÂ and secondly in some cases capacitive screens are not appropriate. You can’t use a capacitive screen with gloves, and also people with hand disabilities would be able to hold a stylus but might have difficulties touching a screen directly with their fingers. 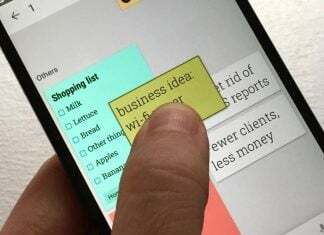 The smaller size will be an issue mainly because lots of applications are not visible in the Market, though that problem should resolve itself once more developers have adapted their apps. See the photos below for the same screens on the Tattoo and Hero. As an example, on a web page in landscape mode you will only be missing a couple of lines. To conclude, the screen will obviously be a key point in a purchase decision, but the Tattoo should not be excluded simply because of its small resistive touchscreen. As I said before, this is a good, small and affordable device… it is an Android device so it can’t be bad!